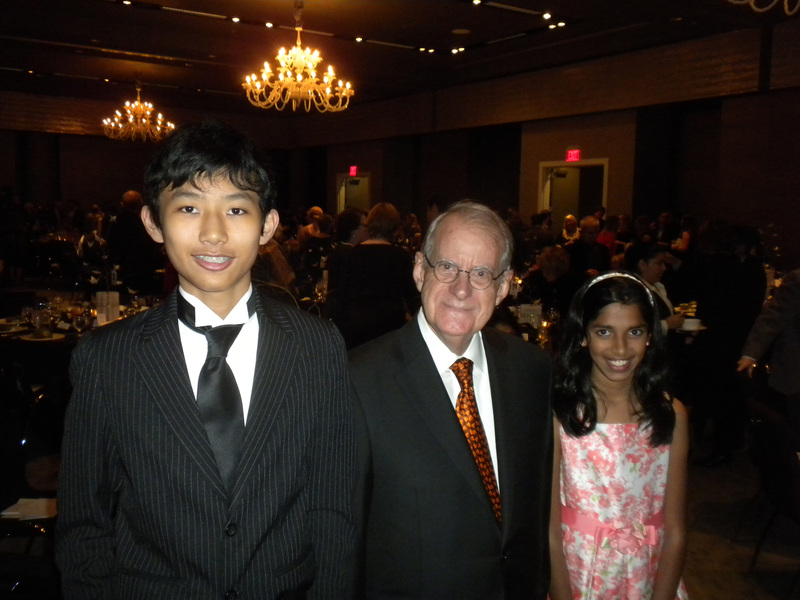 Forrest Preece (middle) with award-winners Jason Luo (left) and Nitya Ganesh (right). This year, Forrest and Linda chose Nitya Ganesh’s poem “Joy” and Jason Luo’s poem “Fearless,” which are included here. This year’s runners-up are Keerthanyaa Arun for her poem “Meant to Be” and Kate Hirschfeld for her poem “The Kinds of People.” You can enjoy their work below. All winners receive a cash prize provided by Forrest and Linda. Both Nitya and Jason read their poems at the Illumine gala on Friday, November 11 — to much applause and fanfare! Congratulations to these four incredible and inspiring writers! And our heartfelt thanks to Forrest and Linda for their continued support of this special honor, one of few that recognizes young writers in our community. 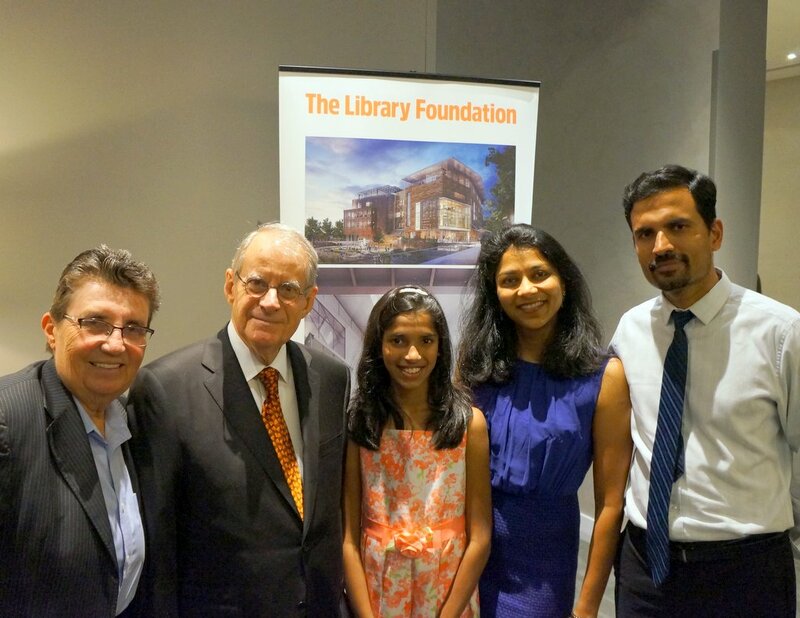 Linda Ball and Forrest Preece with Nitya and her mom and dad. But her eyes were alive with a different inferno. against the volatile world that doubted her so. through the deep blue sea. As if it were meant to be. The dolphin longs to feel that large, tall tree. its eyes look like they are filled with pleas. so I bring it out to see the world it needs to see. It looks at me, its eyes now filled with glee. to when the days were counted not in numbers but in discoveries. expecting a response even when there wasn’t one to give. never knowing what life had in store for us. mud stains on your new dress. said it reminded you of chocolate milk. And everyone knows there’s nothing on this earth better than chocolate milk. Back to when we gazed at the stars so long our eyes themselves began to twinkle. We took to staring contests during the day to share our galaxies. We woke up early to watch the sun paint the sky like a canvas. Call us crazy, but we thought it beat Cartoon Network any day. We searched the sky for the Big Dipper and Orion’s Belt. made them the only ones we needed. Back to when wonder was our only motive. but because we didn’t know to be scared yet. and daydreaming was a common pastime, not a waste of it. We were heroes and wizards and pirates and royalty. We soared through storm clouds and danced with dandelions. and every raindrop was proof that magic really did exist. Bedtime stories didn’t seem so far off. How did magic become merely a device for Disney to make a profit? And four-leaf clovers became so rare we stopped even bothering to look? We stay up late but keep the curtains closed to the cosmos. They say money can’t buy happiness, but it’s starting to replace it. We shy away from opportunity because we finally learned what fear is. We closed our fists and turned our eyes from the skies. Some people never stopped daydreaming. They still wish on dandelions, though some may call them childish. They wander forests in their free time because their curiosity surpasses their fears. and aren’t afraid to get wet if it means dancing in the rain. They seek out the beauty in the extraordinary and the mundane. They live to find stories and never stop looking. only now they search for the answers on their own.